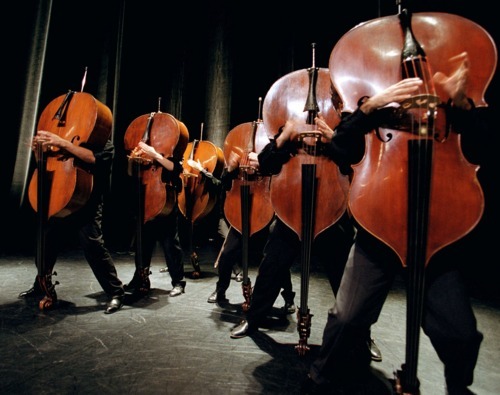 The ever ingenious and inspirational l'Orchestre de Contrebasses are known to be mobile around the stage during their performances, and that can even occasionally include up-ending the bass. A bow stashed in a quiver would surely go flying at such a moment, so what to do? When the bow is not required, hang it on a hook attached to the waistband (or belt) of the player. Being no fan of a bow quiver attached to the tailpiece (I took mine off years ago) I had latterly been using a bow stand fashioned from an old broken music stand. This works great, but it does represent yet another piece of kit to lug around from gig to gig. So I decided to make my own clip hook, taking a drill, hacksaw and Araldite to a plastic trouser hanger that came with a recent purchase. Talking with other players, it became apparent that many are apprehensive about getting their tool kits out and attempting a similar DIY task for themselves. Accordingly, for those who are not so DIY-improvisationally inclined, I decided to make a batch of clip hooks and sell them here. A little research sourced some simple, high quality components and a manufacturing production-line method was devised, each arco clip hook assembled by hand, by me. One word of warning - it's so comfortable and unobtrusive, it's possible to forget the clip is there at your side. I gave myself a surprise (in the hip) when I got into my car recently. Mercifully no lasting damage to me, or the clip! In direct recognition of their inspirational role in the creation of this device, I have undertaken to share a proportion of profits (should there be any) with l'Orchestre de Contrebasses.